KMT Waterjet Aqualine Water for Food Cutting, Cutting Food. 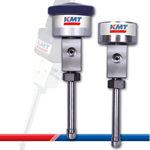 KMT AQUALINE® cutting nozzles for cutting food, cutting cakes, paper slitting and more. KMT Waterjet AQUALINE® Water Only NO/NC Pneumatic Valves (Cutting Nozzles) are designed for better performance and increased production for food cutting, soft materials cutting, robotics, slitting & extreme pressures. KMT Waterjet OEM integrators offer customized waterjet tables designed with KMT Waterjet water only cutting nozzles, for food cutting to cut lettuce, petit fours, cakes, chicken, meat, ice cream, frozen fish, granola bars, frozen food, as well waterjet machines to slit paper. The Normally Open & Normally Closed (NO/NC) Pneumatic valves have very reliable and fast performance due to the 6 stainless steel springs which apply the force to open or close the valve. The re-designed NO/NC valves have an improved stem design and specialized seals which provide a far better performance and enable increased production. KMT Waterjet Valves go through a rigorous 100% piece part inspection process---one more reason KMT has earned the prestigious ISO 9001 Certification.